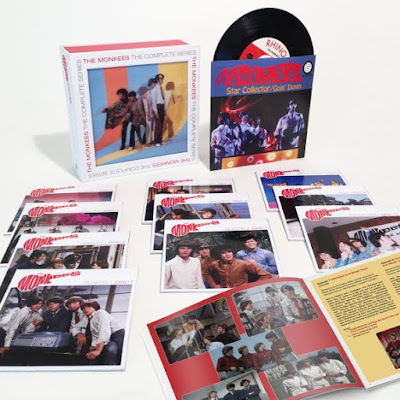 Rhino has posted details and a video highlighting its new Monkees Complete TV Series Blu-ray set. • All 58 episodes, newly remastered in stunning HD from the original negatives for the very first time, plus the 1969 TV Special "33 1/3 Revolutions Per Monkee." • Bonus material featuring commentaries from all four Monkees, vintage television appearances, never-before-seen outtakes and behind the scenes footage, original Kellogg's Monkees commercials, and more. • The 1968 Monkees film "HEAD" in HD with never-before-seen outtakes. • Unique packaging including a 7" featuring "Star Collector" b/w "Goin' Down" in unique TV mono mixes. • Strictly limited to 10,000 individually numbered sets.